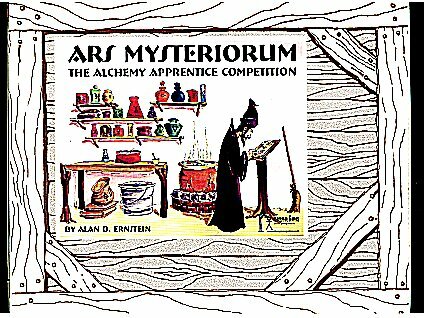 In Ars Mysteriorum, each player participates in King Florim's Alchemy Apprentice Competition. As an apprentice, you will vie to see who can earn the most money by the end of the competion. You will barter favors for basic elements such as Brimstone, Verdigris, and Salt. You will use those elements not only to gain entrance into Masters' tents but to demonstrate to the Masters your ability to successfully complete a recipe. For an alchemist, they are simple recipes like turning lead into gold or sand into rubies. As you complete the recipes, they are added to your Recipe Book, and you are paid at the end of each day for the best combinations of recipes. When the competition is over, the apprentice with the most money will be declared a new Master Alchemist.